See finer primitives, period furniture, and beautiful vintage clothing (from the 1920’s through 1960’s) in Jeannine Osborn’s display booth and showcases. The vintage clothing is in ready-to-wear condition. 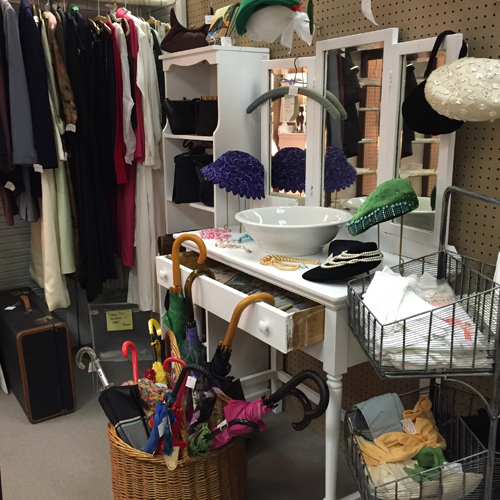 And, don’t miss the lovely fashion accessories such as vintage purses, gloves, hats, jewelry, and more. Jeannine regularly adds unique pieces of 1800’s English ironstone, fabulous brass candlesticks, treen ware, and vintage linens to her space. You’ll also find antique quilts, original and print framed art, unique decorative objects, and special pieces of early American patterned glass–never any reproductions. Beginning in early October every year, Jeannine’s booth and cases are transformed into a Vintage North Pole! Trees full of sparkling, colorful ornaments, Santas, angels, beaded garlands, figurines and more will put a smile on your face and nostalgic joy in your heart. Yes, it’s an eclectic mix. Stop by and shop this ever changing display of antique and vintage treasures!